For congregations in Olympia Presbytery, who want to participate in the Vital Congregations Initiative (2019-2021), this form is DUE to the Executive Presbytery (Rev. Christine Long) by March 29, 2019. Election of Moderator/Vice-Moderator and all nominees for service. Why provide benefits? How to provide benefits? 2019 benefits options and navigating the enrollment process. Led by Rev. 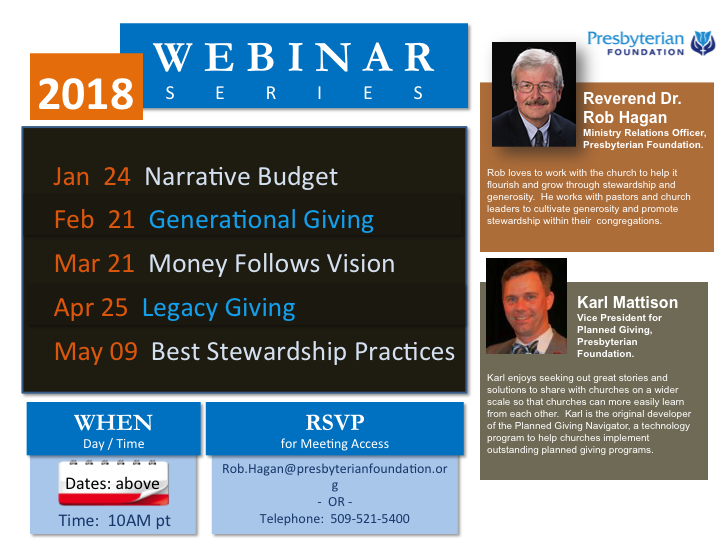 Mark T. Frey, Church Consultant - The Board of Pensions of the Presbyterian Church. REGISTER THROUGH THE SEPT MEETING REGISTRATION BUTTON. Just a reminder! All OlyPres Grants (Hunger, SEED and Revitalization) are being received on a quarterly basis! The next deadline is September 15, 2018. The phrase “come and see” appears twice in the first chapter of John’s Gospel. Jesus invites Andrew and John to “come and see” (John 1:39), and a few verses later Phillip invites the skeptical Nathanael to “come and see” Jesus (John 1:46). Little did any of them know that this invitation to “come and see” would change them forever. Over time, they became a witnessing community to live and speak the Gospel. Their witness changed the world. In this spirit, we invite Christ-followers – a community of ministry leaders, volunteers, pastors and families across borders, vocations and denominations – to “come and see” at the Whitworth Institute of Ministry (WIM), July 23-27, 2018. Now in its fourth decade, WIM is an annual conference providing dedicated time for fellowship, spiritual renewal, Scripture study, and vibrant worship and preaching. The Whitworth University campus is an ideal place for rest and conversation, along with family-friendly programming for children and youth. Those involved in ministerial leadership face a constant variety of challenges. This summer at WIM, Pastor Mary Hulst will lead attendees to reflect upon their ministries and one’s own spiritual formation by exploring the trials within the stories of Old Testament figures. Each sermon will identify a specific ministry challenge, what can be learned from the biblical story, and how we can be attuned to what God is doing in our lives today. Come and see. Monday: "Elijah - Restoration in Weariness"
Tuesday: "Esther - Seeing God in not so Obvious Circumstances"
Wednesday: "Aaron and his Sons - Danger of Doing Things 'Our Way'"
Thursday: "Moses - Frustration with our Followers"
Friday: "Shiprah and Puah - Obedience leads to Faithfulness and Fruitfulness"
In the early Christian period, Christian living became a form of witness because it was so different from how most Romans lived. Christians stood out simply by being Christian. Later, as Western society became officially Christian, that difference became less noticeable and distinct. After all, if everyone is Christian, how can a person distinguish himself or herself as Christian? In the long period of Christendom, Christians distinguished themselves from each other, but not from a larger secular culture because there was no such culture, or so it seemed. Now, Christians no longer live in Christendom, which means Christian living – being so different from how most Americans live – is once more becoming a form of witness. What does it mean to live as Christians in a post-Christendom culture? Each session during Bible Hour will focus on one theme in Colossians 3:12-17 and explore what it means to understand and apply this text to our cultural context. Come and see. Hearing from the Guide Team & Examining their Final Candidate for the New Worshipping Community at the Women's Prison in Gig Harbor. This candidate, if approved, would be a member of the Presbytery Staff. Hearing from the Commissioners to General Assembly upon their return from St. Louis, MO. You are invited to the ordination service for Lara Crutsinger-Perry being held at the United Churches of Olympia on April 22, 2018 at 4pm. The church is located at 110 11th Ave SE Olympia, Wa 98501. The service will be held in the sanctuary. Lara is being ordained in the United Church of Christ and installed as the Associate Pastor at the United Churches. Clergy are invited to robe. Location: Westminster PC, OLYMPIA. 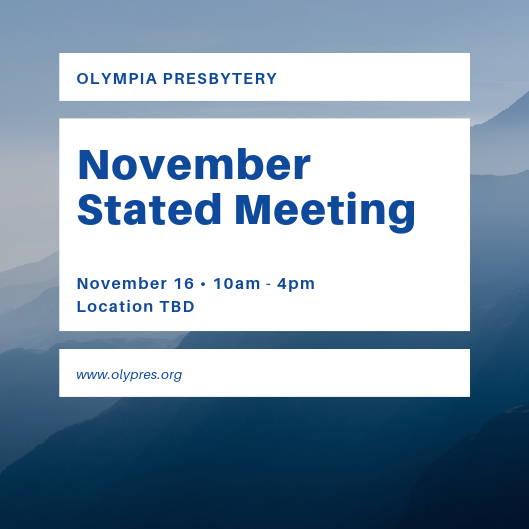 Registration fee: $35, please bring cash or a check made out to: PRESBYTERY OF OLYMPIA. 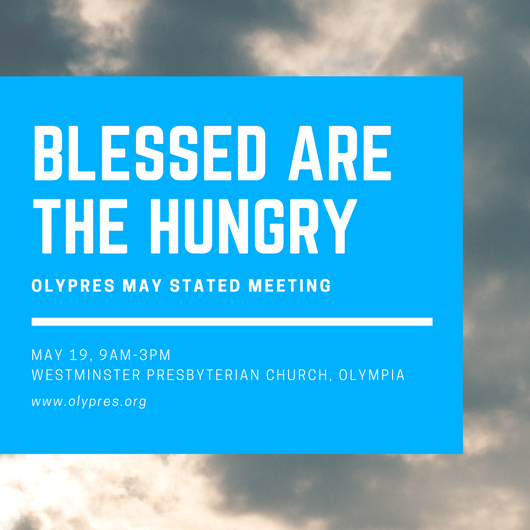 We are happy to invite all of Olympia Presbytery to gather for a Service of Worship and Celebration upon the Installation of Rev. Greg Ikehara-Martin as the Pastor of Ocean Beach Presbyterian Church in Seaview, WA.